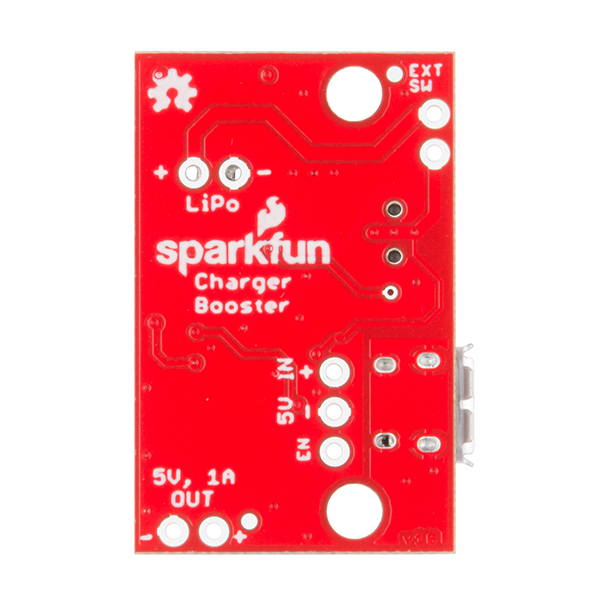 The SparkFun 5V/1A LiPo Charger/Booster is a no-nonsense circuit for generating one amp from a Lithium Polymer battery at 5V. This LiPo charger is a very economical choice that is equipped with a simple booster circuit utilizing the PAM2401 IC, and includes protection diodes so you can run multiple cells in series for an extra kick. 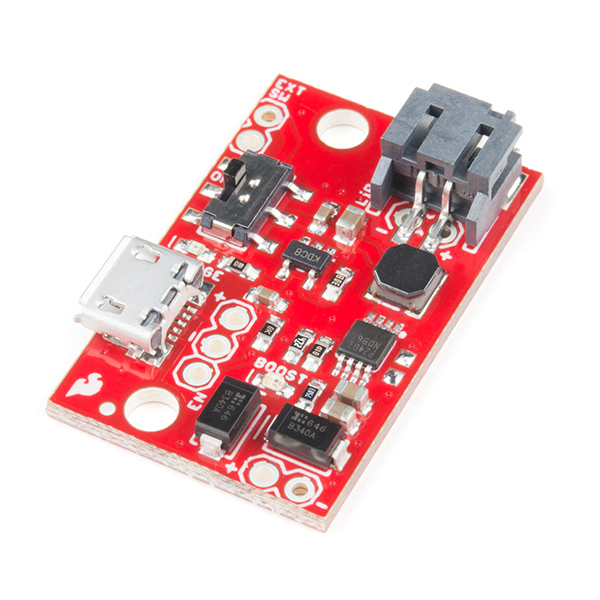 While the booster circuit is in operation, this board can draw more current the lower the input voltage, making it perfect to deliver a strong charge in a small amount of time. The circuit is constructed by feeding an MCP73831 charge controller IC to the LiPo port, and to the input of a PAM2401 boost controller. 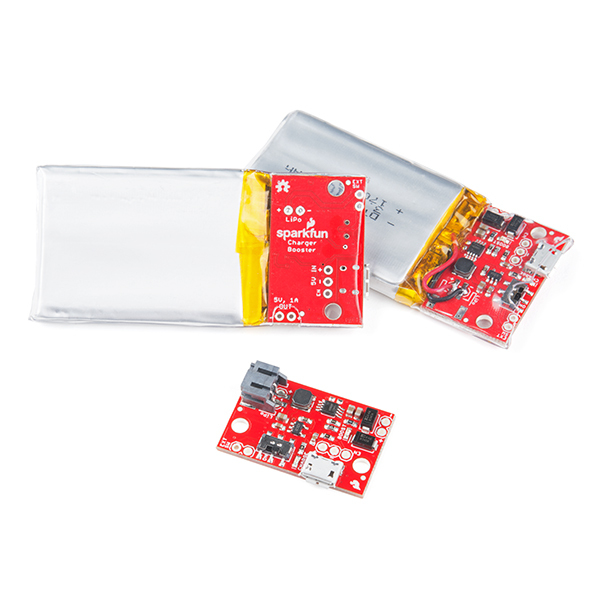 Multiple connection types are provided for the battery, charge source and switch to allow flexibility of application, and two LEDs provide feedback on system status. 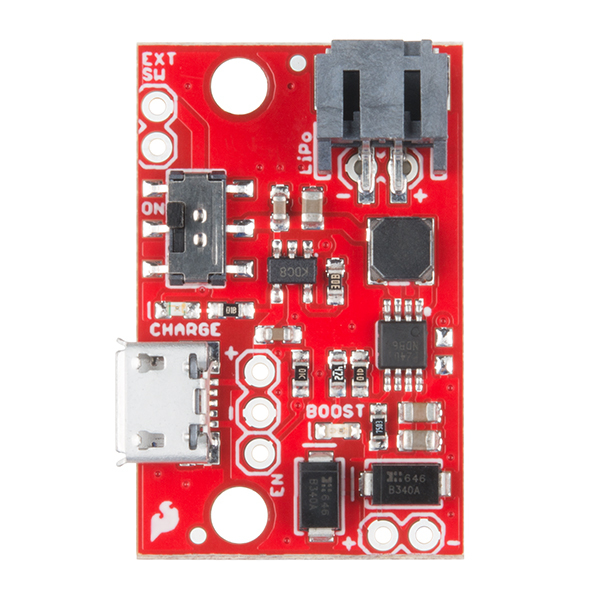 If you need more than 5V out of your project, the SparkFun LiPo Charger/Boosters can also be daisy-chained together to get a bigger bang for your buck. Note: This is not a direct replacement for the SparkFun Power Cell, as it uses a different IC. Also, this board does not possess any undervoltage or other battery protection features, so we do recommend that you use it only with batteries with a built-in protection circuit. This tutorial shows you how to hook up and use the SparkFun 5V/1A LiPo Charger/Booster circuit. Can you hook a solar panel up to the input to charge the battery? Hello! I would like to add a load sharing circuit to this board in order to use a LiPo battery as a backup battery. I've found this load sharing circuit. Do you see any problems in adding the load sharing circuit (Q1, D1 and R2 in my diagram) before the VIN pin of PAM2401? So that when USB power is applied the VIN pin of PAM2401 will be VUSB - VD1 (drop over D1) and when USB power is off the VIN pin of PAM2401 will be VBAT - VSD (drop over Q1). In both cases, my output (PAM2401 output) would be regulated to 5V. Is that correct? Thanks! I have a question about this board. While charging a lipo does the board automatically disconnect the arduino from the lipo and power it off of the external power? I've heard that you shouldn't charge a lipo while it is powering a device. Chris is correct. Pulling the enable pin low disconnects the load from the battery -- I can't remember now but it draws something in the order of microamps during disable. Alternately, I've found that minimal loads (<10mA) will still allow the battery cycle to complete. So if you can put your device to sleep or disable all of its peripherals, that's probably good enough. I just read through the "getting started" guide and from that my understanding is "no." There are two options for turning power to the battery off: the battery switch and the "en" pin. Hoping to bump this up as it would be great for the designer to answer the question. I'd like to use this in a simple circuit that can be plugged in to charge. What I'm trying to figure out, as you are, is do we need to instruct the end user to "power off" the device before charging, or can they simply plug it in? Even more specifically: i have a 1Ah LiPo, this, an Esp8266, and a small haptic motor. I'd like to package it up and let people re-charge it. Is that safe? Or, should I turn breakout the battery switch, and have people "turn it off" before plugging in to charge? This is a pretty basic circuit, I've found that projects I make have a variety of needs so I have to get a bit creative depending on how I want the circuit to operate. If you want the load to automatically be disconnected, use a small N type mosfet to pull the enable pin low with the gate connected to the USB in rail through a resistor. If you require the load to stay active (and can tolerate a 0.5v drop) do the above but also put a pair of schottky diodes ORing the USB rail and the output rail to your load. That way the system will redirect power through the supply while pulling the booster offline. If there's too much of a gap in power, build an RC filter on the gate to delay the disconnection. One project I built has a button wired to turn on the system (microcontroller) when held, and the microcontroller can then power itself off. So in this instance I simply shut the device down before charging. See this Enginursday. So what is going to happen if I am providing power to the charger over USB while simultaneously drawing 1A from the PAM? FYI, the babysitter in the post uses high to disable rather than low to disable. I recently bought this charger and a 1000mAh battery. I charged it with no issues, then used in my setup it until it stopped sending power. I plugged in a micro usb cable to charge it for 48hrs, and the charge light remained on the whole time. When I plugged it back into my setup, it died within 10 minutes. Do you know what might be going wrong? Could this be causing an issue? I realized that I got the Ext SW switch and the Enable pin mixed up. I was trying to charge with the battery disconnected! Seems to be working now. Sounds great! Sorry if it was confusing. As for that inductor, it shouldn't be chipped like that but it probably won't effect operation -- if the whole top comes off then maybe. It's part of the boost circuit anyway. If it fails you'll have poor (or no) current output capacity but the charger will still work. I was checking out the PAM2401 spec sheet, and the chip puts out a maximum of 3.0A at 5.0V, if I am not mistaken. The current limit is set by the external resistor, on pin #6 of the chip. If the pin is left floating (which apparently it is on your board, but maybe I cannot see the trace), then the current limit is 3.0A. So I'm wondering why don't you call this a 5-V/3-A charger booster? At any rate, I could use the 3.0A, so if you would kindly point out this resistor R3 so I may remove it, I would be much obliged! Good question. While the PAM has current limiting capacity through that resistor, the current limiting factor here is actually the inductor (as well as the source's current capacity). Let's say the thing is 100% efficient, 5W out = 5W in. If the output is delivering 1A at 5V, that's 5W power output. If the input is at 2.5V, and 5W is required going in, it needs 2A of input current. The winding of the inductor has resistance which can get in the way of the operation at high currents. See more including some graphs in the hookup guide connecting a load section. All boosters have this property-- the lower the input voltage, the higher the input current. I designed this such that it can deliver 1A over the entire input voltage range of a LiPo. I actually took my measurements up to 1.3A on the output, but I'd rather provide something with a healthy margin that to call it a 1.3A booster. Thanks for the fast reply MT, on a holiday no less. The graphs are indeed revealing. I don't know enough about switch-mode regulators to understand fully, but I can appreciate Power In = Power Out (at 100% efficiency). It's nice to know that there is some (substantial) margin above 1A output current. In my application, I am driving LEDs, a motor, and a fairly high wattage camera, so I will have to be careful about coordinating these things. If I had the 3A output, I would not have to worry nearly as much. Thanks again. Above it says "includes protection diodes so you can run multiple cells in series for an extra kick". This is misleading and should say multiple charger/boost boards in series instead of cells. The PAM2401 datasheet shows a max input voltage of 4.75V, which is less than 2 lipo cells in series. And the MCP73831 doesn't look like it will charge cells in series. Running cells in series would likely kill the board. is this available for higher voltage like 6 or 7v? If not are there any solutions for 6v battery charging? Meh... Still waiting for a 2-3S Lipo board with 2-5A output at 5V. As mentioned the Adafruit board has been out for a while now and 1A is old news. I have plenty of applications for a 2a+ board that something like this can't be used for. Find me a budget all-in-one $20 -$25 board for 2-5A and I'm in. Would I be able to shut down the charging circuit using a microcontroller when the temperature gets below freezing, without turning off the load? Or does the charging IC do that automatically? According to a brief reading into the datasheet it appears to not have this functionality, unless there's something I'm missing. That's kind of an interesting problem, you want to continue to boost but not charge, all while leaving the charger connected. There's no shutdown pin on the charger IC. I would investigate using a mosfet to switch the charger in and out of the circuit. Looking for an easy way to adjust the output voltage, although it is not as straightforward as the LiPower. I tried changing R4 to 688k and 488k just to see if I could get the divider to alter the output, but the output voltage remained the same at 5.1. Is the inductor critical in reducing the boost? I can't say the datasheet or application notes are very helpful. I am looking for something in the 3.6-4.2V range so I don't have to use another stage of regulator. The booster is regulating to 0.6V on the feedback pin (FB). Adjust the voltage divider made by R1 and R4 using 0.6 and your desired output voltage as constraints, and it should be OK. I solved R4=600k (with R1=100k) for 4.2V output... maybe there's something else going on here. The inductor value is not critical to regulation voltage. Also, R4 is stuffed with 750K from the factory so I'm not sure what's up. I'll let you know if I discover anything. Keep in mind you can't buck down from a larger battery voltage! The PAM2401 only boosts. Thanks for the reply. For the record, I am boosting from a 3.0V lithium primary source. I was completely stumped this morning, so I downloaded the Eagle files. Just noticed that there is an identical 750k (R2) that I thought was R4. Whoops -- wrong resistor! Perhaps R2 isn't too important..since that tiny 750k is long gone anyway. It might be helpful to spin future versions of this board with silkscreen, or at least the voltage divider labeled. I am loving the 1A boost capability of this chip, excited to see it in action. Nice product. I can see lots of places I could use it. A couple of questions about the design. I noticed 2 22uF caps on the output. Is this because 22uF was deemed not sufficient? And by using 3 22uF caps you get a better volume discount than on 1 22uF and 1 47uF? Also, what is the purpose of the 2 schottky diodes on the output? I get why one (to chain chargers) but why 2? My main concern when designing this was to make sure the voltage was very noise-free on the output. I can't stand supplies that whine! With that in mind, output capacitance required is a based on the transient load characteristics, which I don't have any control over. a single 22uF may have been fine, but two is better here! And yes, I was considering that less specific components on the board means less work to build, even if it's only a single reel in a machine. 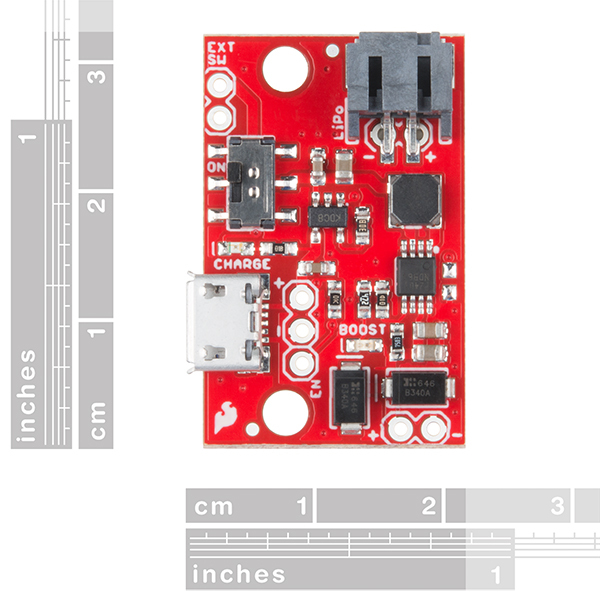 The diodes allow the boards to be used in series -- see the hookup guide for more info. If one goes dead in a chain, the current will be passed by.